Australia: where nature is 10 times larger and 10 times more dangerous. 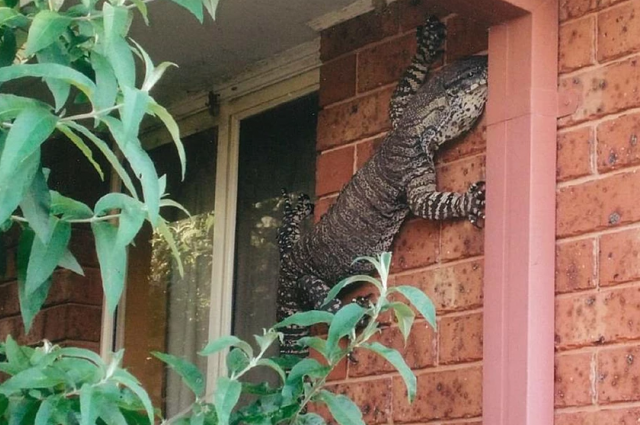 As further proof of this, a man called Eric Holland has captured a picture of a 1.5-meter-long (5-foot-long) lizard crawling across his house. The photograph was taken in Thurgoona, New South Wales, and shows a lace monitor lizard. These miniature Aussie godzillas can grow up to two meters (6.5 foot) long and are carnivorous, usually feasting on a diet of birds, eggs, small mammals, and other reptiles. However, it is a rare sight to see one of these reptiles in a built-up area, as they usually shy away from the hustle and bustle of humans by retreating deep into the eastern Australian bush.